Produces a shocking blaze of super-charged color all summer long. From award-winning ‘Jolt’ series, ultra-vivid cherry shade mixes magnificently with celosia, rudbeckia and echinacea in the front of the sunny border; downright awesome in a container. 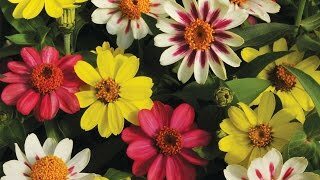 Well-branching 16-20” plants are soon ablaze with lightly fragrant, high-saturation blooms—producing bouquet after bouquet of dazzling cut flowers. Easy to grow and care for. Dianthus, Jolt Cherry is rated 5.0 out of 5 by 4. Rated 5 out of 5 by Flyingranny from Beautiful! These plants are beautiful, and the best part is the deer don't eat them! Rated 5 out of 5 by Mississippi Belle from Beautiful color and flowers! I bought this because I had been looking for it many years. My mother in-law called them Sweet Williams. I realized some people called phlox Sweet Williams and was very confused about the correct names. When I saw this full grown plant, it was what I had been looking for. The card in the plant, however, said they are perennials but this site says they are annuals. I am in zone 7, so I hope they are perennials. The blooms are already fading and I am not sure how to deadhead them. It is mid June. Sure hope they bloom longer than this. I do not see anything that looks like new blooms growing. Rated 5 out of 5 by travelingsenior from Absolutely stunning! I bought this several months ago and the germination rate was very good. Mass plantings were absolutely stunning. In the future, however, I would stagger the plantings so the blossoms won't all die at the same time. Here in Hawaii, many flowers act as perennials, so I'll wait and see whether the pruned dianthus will rebloom. Rated 5 out of 5 by Veron from I bought the jolt cherry because I had a "cherry" color theme going on with one of my displays. I definitely recommend them for planting in a grouping for full effect. I did plant a few interwoven through other flowers and they were pretty, too. I would recommend these flowers for the color enthusiast.